HARVEY is a family of flexible audio and media control matrices and key component for PA and conference systems. The HARVEY family is equipped with up two 32 analog audio input or output channels as well as a large number of different control interfaces. The unit has extensive audio processing functions that can be configured in a way that is tailored precisely to the respective application. These settings can also be saved in presets and retrieved at the press of a button so that you can change quickly between different installation options. Due to the varied control interfaces HARVEY can connect to very different devices and act as the central control unit for audio, lighting and media. HARVEY is available in different configurations regarding the number of analog I/O channels. The table shows the current offering. Variants 0xN and Nx0 require the Dante option. Until further notice, the configurations 12×16 and 16×16 are supported by HARVEY mx.16. Other configurations and AES/EBU 10 capability will follow. TECHNOLOGY. HARVEY converts the data between the interfaces and eliminates the need for additional converters. All established media control systems from Crestron, AMX, and Cue are suitable for controlling HARVEY and all other devices connected to it. Furthermore HARVEY features the ability to be controlled by modern web browsers. For that purpose the web interface can be generated with a single click and adjusted by the user without any programming knowledge. As such, HARVEY is the ideal audio and media control matrix for conference rooms, theatres, museums, home cinemas, educational facilities and multipurpose rooms. 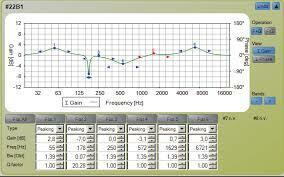 Audio Inputs: Each input can be configured by software as line level input or as microphone level input. Inputs are equipped with software controllable 48 V phantom power (P48). Audio Outputs: Analog balanced line level outputs, e.g. for driving amplifiers inputs. Dante: Optionally available; for connecting several HARVEY units and exchanging digital audio streams among the units and other Dante devices via an Ethernet network. Ethernet: Connection to configuration PC as well as other controlling devices or devices to be controlled. RS232, RS485/DMX512: Interfaces for remote control and exchange of control commands of HARVEY units and external devices, e.g. lighting installations, PA systems, media technology or operating panels. Digital Control Inputs: 4logic inputs for switching and controlling presets and binary parameters, e.g. muting channels with external tactile switches. Analog Control Inputs: 2 analog inputs to externally control HARVEY parameters, e.g. level by potentiometer. 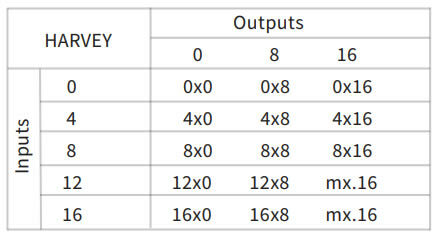 Digital Control Outputs: 4 logic outputs for the control of external devices, e.g. relays or LEOs. Relay Outputs: 2 outputs for galvanically isolated control output of external devices. HARVEY Composer, the user interface of the HARVEY family, has a very user-friendly design and allows you to configure complex projects with only a few mouse clicks. Blocks, that represent the audio signal processing and control functions, are positioned on the worksheet using drag & drop. With only one movement of your mouse multiple channels can be connected, while the number of channels is adjusted automatically. Independent of the number of physical connections, individual connections are combined into clear bundles. Signal processing functions such as EQ, level display or ducker and many others can be added to the installation simply by drag & drop and configured online. Mixing and switching matrices are also available and can be parameterized freely. In addition to the audio layer, there is also a control layer. Incoming control signals are evaluated here, linked logically and brought to the audio block control inputs. Presets allow you to switch conveniently between very different use cases. HARVEY fades softly between the presets with configurable fade time per parameter. HARVEY RC4 is a programmable, Ethernet-based wall-mount remote control. RC4 is capable to control presets, audio levels or DMX-lamps. All RC4 LEDs and buttons can be individually customized in their color and brightness.